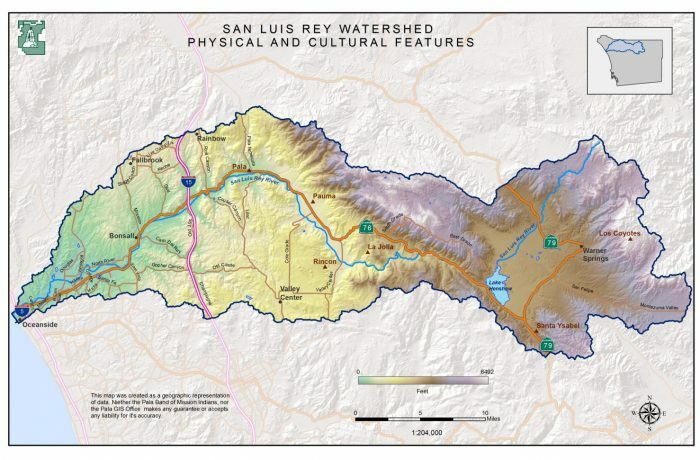 This map depicts the main roads within the San Luis Rey Watershed. Highway 76 runs east to west along most of the length of the watershed. Interstate 5 and 15 also run north to south, both in the western half of the watershed. The color gradations on the map show the various elevations with the San Luis Rey Watershed. This watershed ranges from sea level, at Oceanside, all the way up to 6,492 feet at Hot Springs Mountain on the eastern edge.